Gone are the days of a traditional reception food! It’s your big day, so why not put your own twist on the selection which will not only fill you and your guests up, but blow them away. Let your food speak for itself, and let your guests keep speaking about your food. Here are some new and trendy ways that you can give your menu personal touches from the cocktails to the main dishes, and of course the sweet treats that will make your big day so much more special. Start the Evening Off Right! 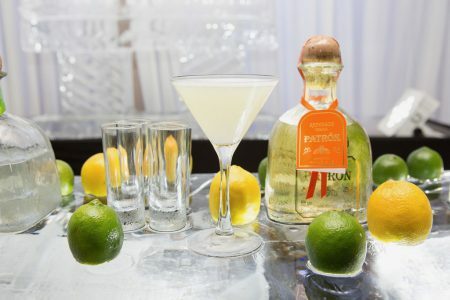 It’s time to get the party started – Cocktail hour. 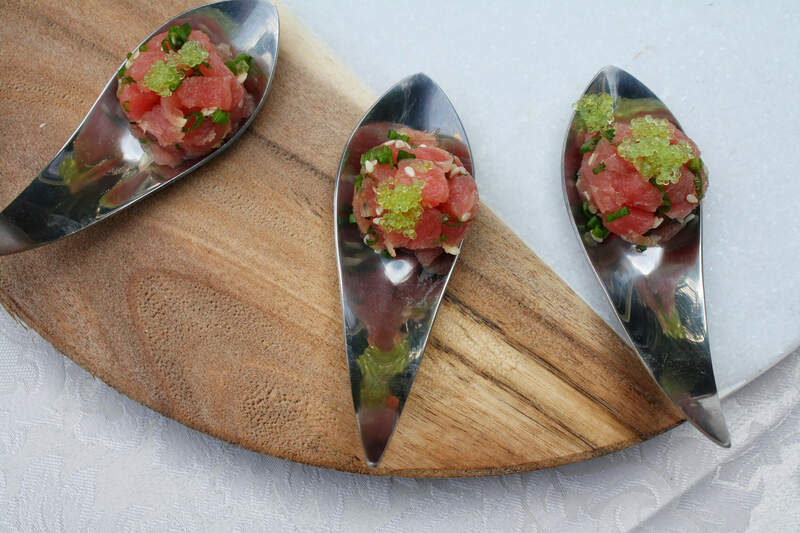 Step up your canape and champagne by delighting your guests with a personally crafted cocktail and some of the year’s most trending bites. Go above and beyond with a little bit of surf and turf – a raw bar and grazing table. 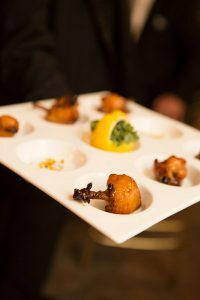 This year’s hottest cocktail hour trends are raw bars and sharing boards, take it up a notch and surprise your guests with the chance to experiment and taste new flavors such as some locally sourced oysters, Peruvian ceviche, Hawaiian poke, and a grazing table with a selection of Italian meats. Fresh brie and prosciutto or oysters and caviar are fantastic, but not as delicious as when they’re complemented with a specially crafted beverage. Treat your guests to a crafted cocktail (or mocktail), with elements from the theme of your special day, favorite flavors, or even a seasonal flavor depending on the time of year. The biggest drink trends for the year are craft beer, infused cocktails and mocktails. You can achieve total food bliss by pairing cured Italian prosciutto with a craft IPA from your favorite local microbrewery, or stick with 2018’s most popular cocktail, an infused gin and tonic garnished with lemon and cucumber. 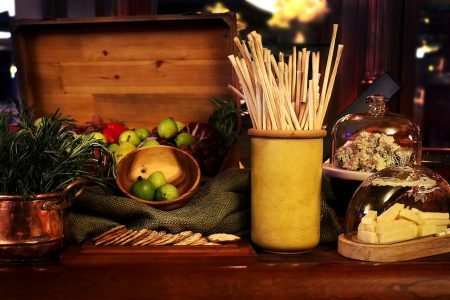 Draw outside the lines of tradition and allow your guests to immerse themselves on a food journey with crafted food stations. Take your favorite flavors and turn them into stations where you and your guests can try a bit of your favorites, some classics, or something new. One of the biggest food trends is incorporating comfort foods into your menu (read all about stepping up the comfort food game here)! Why not merge this trend with one of the best comfort foods around, Pizzaand Pasta! 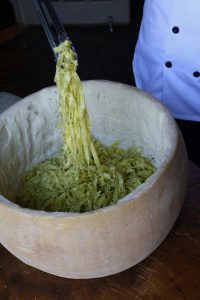 Though this doesn’t seem like a typical wedding food, wow your guests with a selection of gourmet pizzas including a classic like Margherita and something trendy like truffle and prosciutto. Take it a step further by letting your guests indulge on their own pizza creation. Set up a station inspired by Japanese flavors – izakaya style dishes and a sushi bar. Sushi can be unconventional as well; however, it will definitely impress your guests. 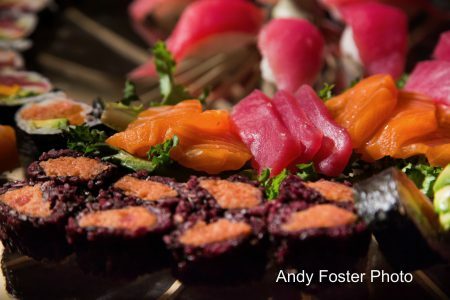 Something you can try out is having a chef make fresh sushi and nigiri, or have pre-rolled sushi, Vietnamese rolls, and izakaya skewers. Satisfy the palates of all your guests whether it be sweet or savory, meat or fish, vegetarian/vegan or Kosher/Glatt Kosher, by offering chicken and beef, shrimp and fish, or tofu and vegetables. 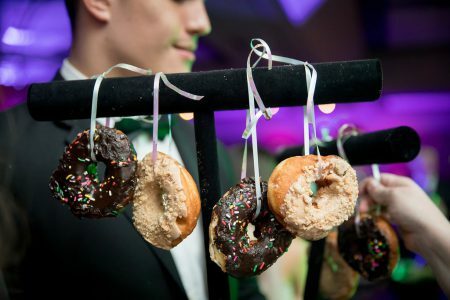 Sweeten up your special day with one of the biggest coming wedding trends, a donut bar. Donuts roll out of tradition, but they sit at the top of the trend list. Treat your guest’s sweet tooth with an unlimited variety of fresh and uniquely flavored donuts. Decorate them to match your theme, your favorite quotes, and even pictures. To wash the donuts down, set up a coffee bar featuring espresso and coffee infused cocktails to keep your guests dancing all night long. Whether you want to keep your menu more on the traditional side, or add a little twist, you’ll be sure to shine on your special day and leave your guests with a taste for more!